OSWEGO, NY – Linda Coleman, a bus driver with Oswego City School District, came to the Public Computing Center at Oswego Public Library on Feb. 24, hoping to learn a skill she needs to advance in her job. Linda signed up for SBDI training to become a School Bus Driver Instructor, and was told that she needs to know how to use PowerPoint, a computer program, in order to take the SBDI training. 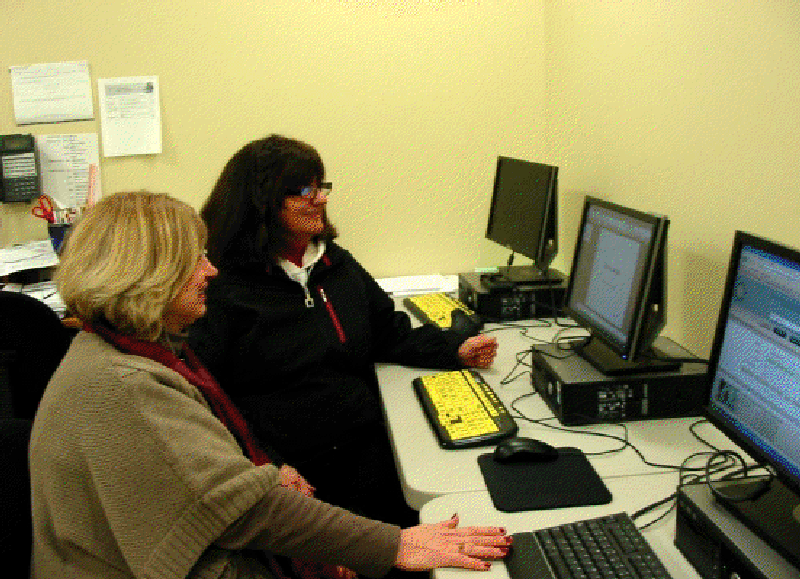 Linda Coleman (in back), of Oswego, learns to make PowerPoint presentations with the help of Public Computing Center Director Theresa Slosek. A friend who has taken computer courses at the Public Computing Center referred Linda to the PCC. Linda arrived during an open lab time and was given individual instruction by PCC Director Theresa Slosek. Public Computing Center workshops and computer training are provided free of charge through a Broadband Technology Opportunity (BTOP) grant. Now that she has the skills she needs to take the SBDI training, Linda no longer feels that way. Once Linda completes her SBDI training and becomes a certified School Bus Driver Instructor, she can teach bus safety procedures to bus drivers in any school district and receive extra compensation for doing so. It is something Linda is looking forward to. For more information about workshops, courses, and open lab times at the Public Computing Center, please call 341-5867 x214 or visit the main desk at Oswego Public Library, 120 E. Second St.